Video clip synopsis – The people of Bikini Atoll are still waiting to return home more than 50 years after the United States Navy removed them. Broadband MP4 alifetime_bb.mp4 (14.7MB), suitable for iPods and computer downloads. A Lifetime in Limbo is an excerpt from the documentary The Marshall Islands – Living with the Bomb, an episode of the six-part series The Human Face of the Pacific, made in 1983. The people of the Bikini Atoll were removed from their homelands as a result of American testing of nuclear bombs in the Pacific. They now live on another island, dependent on American food and support. They can never go back to Bikini Atoll because it is poisoned beyond the possibility of habitation. This film is a poignant, impressive study of a people whose culture has been vanquished. P4.2 communicate a knowledge and understanding of historical features and issues, using appropriate and well-structured oral and written forms. After World War 2 the Pacific became a ‘nuclear playground’ as the US, Britain and France conducted atomic and nuclear tests. From 1946, 67 nuclear weapons were exploded in the Marshall Islands. The US claimed that the destructive potential of atomic energy could usher in a new age of peace and an end to world wars. The traditional inhabitants of Bikini atoll were evacuated on a ‘temporary basis’ in 1946 to make way for the tests. Over the next few years they were relocated to the atolls of Rongerik, Kwajalein, Kili and Jaluit. To this day they still have not been able to resettle permanently on Bikini due to residue levels of radiation appearing in food supplies like coconut and breadfruit. 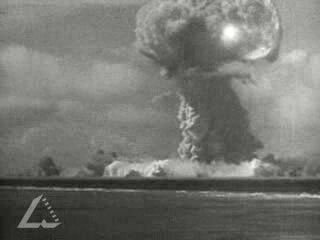 The biggest and most damaging blast in the Marshall Islands was the H-bomb known as ‘Bravo’ in 1954. Hundreds of times more powerful than the bombs dropped on Hiroshima and Nagasaki, the fallout and scale of damage was enormous and not predicted by scientists. Investigate the background to the nuclear testing in the Marshall Islands. Find out what the geographic, ideological and political motives were for the testing done by the United States. Apart from the Marshall Islands – where else in the Pacific was nuclear testing carried out? After watching this video clip record what you see as the problems for the Bikini Islanders today. Consider whether you believe the US authorities would have anticipated such problems for the Bikini islanders into the twenty-first century.